Give the gift of health and let us do the eco-friendly wrapping for you. Indulge and delight. 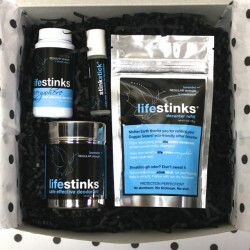 Share the lifestinks experience. Chic meets green. Happy meets healthy. Sensational boxed assortment in your favorite flavor and strength. A lifetime refillable stainless steel sifter decanter for home use. The refillable dispenser can includes a 9-month month supply of the dry deodorant. An everywhere travel size container for showering away from home. 2.25 oz. 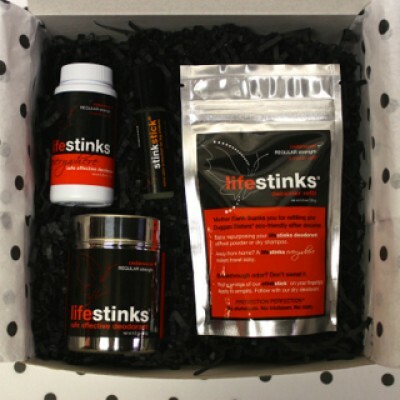 - containing a 4-month supply of lifestinks dry deodorant. A stinkstink deodorant booster. Extra odor control for the big stinkers. 110 applications of pure deodorant oil. Lavender & tea tree oil blend. Our unique lifestinks® refill bag. 4.5 oz. refill bag. - include a 9-month refill for their lifetime container. This gift keeps on giving! Ingredients lavender regular strength: lifestinks deodorant: aluminum-free sodium bicarbonate, lavandula angustifolia (lavender), and melaleuca alternifolia (tea tree); stinkstick deodorant booster: lavandula angustifolia (lavender) and melaleuca alternifolia (tea tree). We offer 100% recycled gift-wrap tied with a luxurious grosgrain ribbon for these exclusive Duggan Sisters boxed & tissued gift sets. 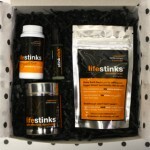 Enjoy giving our earth-friendly gift sets! from recycled banana peel for our Duggan Sisters gift bag sets. Explore all our gift set options. Aluminum free. Stain free. Talc free.